The Japanese Grassroots Human Security Project is funding, with support from government and local stakeholders, the construction of the first pre-school and a multi-purpose centre in St George’s Estate, La Mode. The signing ceremony took place on the eve of Grenada’s 44th Independence, on 6 February 2018, at the Ministry of Education and Human Resource Development. Maudlyn James, Co-Pastor at the Faith Community Christian Union Church and a District Education Officer, is the project manager. James was instrumental in developing and proposing the project, which is now financed to Faith Community Christian Union Church. The project proposal was submitted in December 2016. This recent Japanese Grassroots Human Security or GGP project is valued at more than US$83,300 and, with audit included, is worth more than US$86,000. The pre-school and multi-purpose centre will benefit the community of La Mode and surrounding areas, but particularly the community of La Mode and St George’s Estate, where there is currently no pre-school, despite an increase in household development. 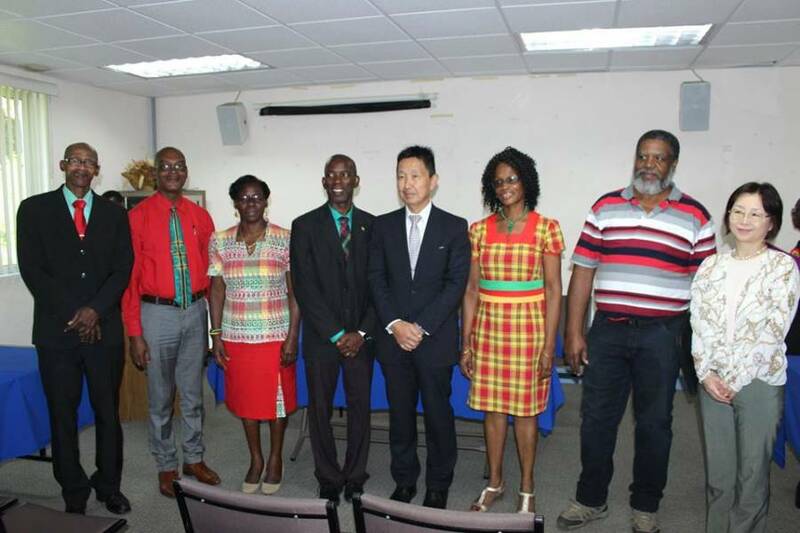 His Excellency Mitsuhiko Okada, Ambassador of Japan to Grenada, spoke at the ceremony. “The Government of Japan recognises the importance of cooperation between known governmental organisations and local public authorities, in responding to various development needs in communities,” he said. Samuel Vernon Drakes of Samuel Drakes and Associates, architect for the project, said building plans are currently pending approval. He gave some insight into what the project entails. “There will be a complete open room for the students and there will be toilet facilities for both male and female. There’ll be an office for the staff, as well as staff toilets,” he said of the design for the pre-school and its amenities. Additionally, the multi-purpose centre will include two sections for skill training, outfitted with kitchens and related fixtures, and a fenced playground area outside. The building will be a two-level structure. Once final plans are approved, the project will begin. The contractor anticipates all work will be completed within the current year. “We will be given additional support by the Government of Grenada and, as you would see, Mr Tobias here is standing with us, because he has already made commitment from his community project,” James noted.